The Yahoo! Store Checkout Manager allows you to customize all aspects of your store's checkout process from the checkout flow, through checkout page configuration and looks to custom fields and more. 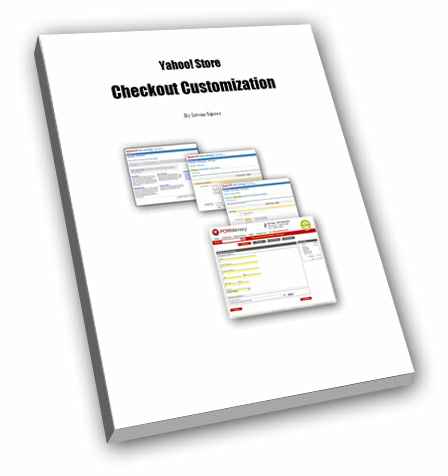 While at first glance Checkout Manager may seem complicated, with this easy-to-follow e-book you can understand and learn Checkout Manager and customize your Yahoo! Store's shopping cart and checkout pages. Includes lots of illustrations and a number of easy to more advanced tips and tricks. Is this e-book useful for store editor ver 3.0? Yes, because the checkout is entirely separate from the rest of the store, it doesn't matter whether you are using editor version 2.0 or 3.0. Excellent!!!! Both work and service better. Reasonably priced, excellent quality.\"